Some people have sought guidance in dealing with this matter and understanding and completing the Council’s forms. Therefore the following suggestions and information is simply supplied in the hope that it will assist any who wish to use it. (b) You can respond on line or, using the forms, by Freepost. (c) Quite apart from the forms, you can also write your personal views as a submission, and if you wish, include the forms with your written comments, or ignore the forms. It is useful to label whatever you send in as a submission, and to keep a copy. (d) Submissions to the Council close on Monday 18 February. THE FOLLOWING COMMENTS ARE INFORMED SUGGESTIONS ONLY AND IF YOU CHOOSE TO USE ANY OF THEM, THEN THAT’S AT YOUR DISCRETION. Unfortunately the Council forms are not numbered, so the following comments are using ‘virtual’ numbering. ‘YOUR CONTACT DETAILS’ (essential) and DEMOGRAPHICS (optional). Proposal 1 - “legacy bylaws” are simply those from the previous Councils. Comment: Little confidence in Council managing freedom camping more pro-actively. No bylaws seem to have been actively managed or enforced. Proposal 2 - Comment: “Increasing the number of areas” for freedom campers will only encourage more campers and pressure. Proposal 3 - Comment: Again this proposal depends on strong monitoring and enforcement. There is no actual plan, budget, or size of the enforcement group available. The only figure available seems to be for $70,000 for signage across the whole region. Proposal 4 - Limit of 2 nights stay for campers on each of the designated parks. Comment: there should be NO freedom camping anywhere in Little Shoal Bay Reserve. Suggest tick “Disagree, allow fewer than 2 nights – ie Zero. Proposal 5 - Leaving time. Comment: Freedom camping should not be in “high use” areas. No matter where they are they should not be required to leave before 9.30am because that will add to our chronic congestion problems. Proposed Restricted, Non-Self-Contained Permitted Areas - Freedom Camping in Vehicles. 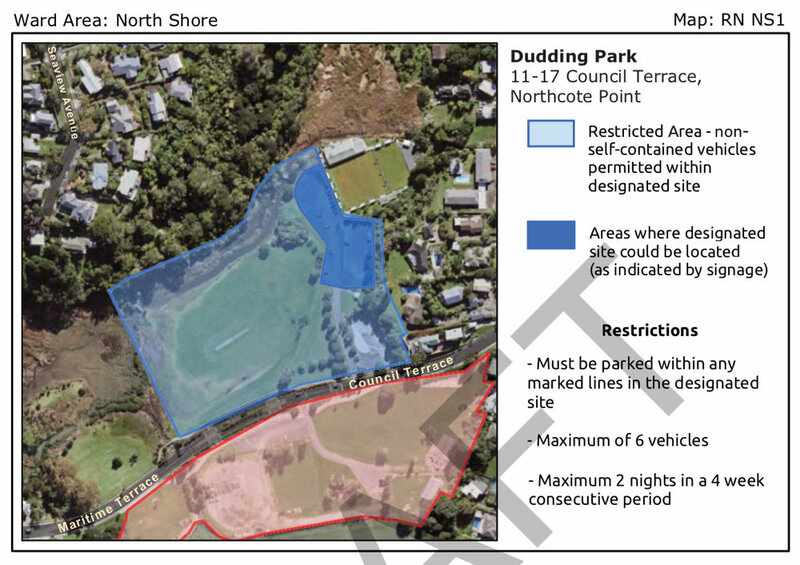 Area name: Dudding Park/LSB Reserve, Kaipatiki L.B. Area. Third question: suggest tick No camping in this area. Seventh :suggest tick the TWO “YES” boxes. Proposed Prohibited Areas - Freedom Camping in Vehicles. Area name: Little Shoal Bay Reserve, Maritime Tce, Kaipatiki L.B. Area. Comments: REMEMBER, COUNCIL IS PROPOSING THAT CAMPING IN THIS AREA BE PROHIBITED, so hopefully you will support this Prohibition on Freedom Campers. Question 1: Suggest tick YES. We hope that this has been of some assistance to you.